It has been a week since I last posted. Whoops! I meant to get more done, faster. But, it just didnt happen that way! Anyway, here is what you really want! The 3rd Regiment of Foot Guards (Scots Guards) in their completed glory! Together with the Coldstreamers, they made up the 2nd (British) Guards Brigade, under Major General Byng. At Waterloo they were tasked with defending the Hougoumont farm, which is a very long story that I can't be bothered going into here! I got these guys done over the past 3 days, painting about 8 per day. Not the most industrious, but not bad. Here is their officer, looking far better than he did last time I posted! Yikes, these photos are dark. I do need to look into my photographing. 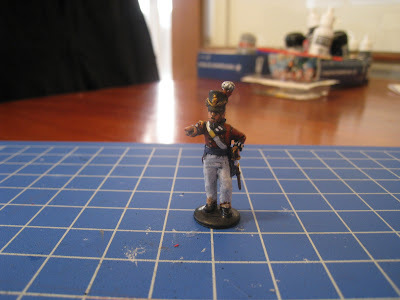 So, in keeping with my random Napoleonic anecdotes that seem to be proliferating this blog; on the note of Curiassers. Now, after the battle at Quatre Bras the 92nd Highlanders, after a long hard day of suffering through repeated cavalry and infantry attacks finally got a respite. They also got some steaks to eat. So, the story goes that French prisoners were being marshalled past Highlanders cooking steaks on the curiass of fallen French cavalrymen! 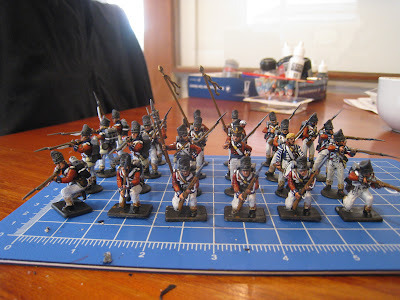 Apparently they worked very well, despite the musket holes. The prisoners thought the Highlanders cannibals, further adding to their fearsome reputation! Quite industrious painting sched actually Pooch, looking good as well!